Born into a small kriel close to some cygnarian villages, Horthol learned soon about the rising tensions between trollkin and humans. As his kriel decided to move deeper into the forests to join the United Kriels, Horthol and his kith decided not to go with them, but settled in a human village. Life was not easy inside the human community and when Horthol came of age, even though he had a keen understanding of alchemy, he had trouble finding work. As many other young people this drove Horthol to join the military. 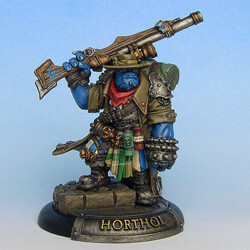 The army set Horthol to work in a supply division, mainly brewing potions, until a Gun Mage officer spotted Horthol’s hidden gift with the magelock rifle. He took Horthol under his wing and after only a few month he was part of a special Gun Mage unit. His military life was adventurous and exiting, until his unit was ordered to Caspia, due to the thread of war with Sul. 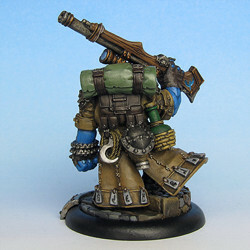 The rest of his service commitment he spent on the walls of Caspia, watching sulese Deliverers pointing their Skyhammer rockets at him and brewing potions. When his tour of duty was over, he left the military, looking once again for the kind of adventure and excitement he experienced while with this Gun Mage unit. The Privateer Press Epic Grim Angus mini has been converted a bit to bring Hortol to the tabletop.